A team of Stirling make-up artists has been named Britain’s Bridal Make Up Specialist of the Year. Zoo Hair & Beauty beat off competition from scores of salons across Scotland, England and Wales to win the national award. 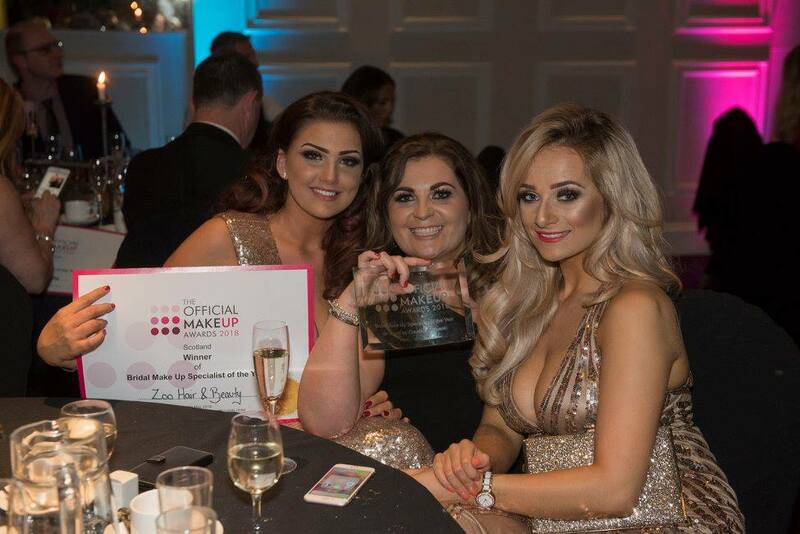 The talented team, led by salon owner Nicki Regan and head make-up artist Ashleigh McArthur, won the Scottish title at the inaugural Official Make Up Awards held in Manchester. They were also named overall winners, ahead of the other category-winning salons from Wales and three English regions, in the bid to find Britain’s best Bridal Make Up Specialist. “We were totally overwhelmed when our name was called out as the national winner. “We had gone to Manchester hoping we might do well in the Scottish category and were delighted to win that. “But we in no way expected to win the overall prize and were genuinely amazed and over the moon at that. Ms Regan has been running Zoo Hair & Beauty from Upper Craigs in Stirling for the past three years and has worked in the beauty industry for more than 20 years. Last year, she and her team won the Hair Salon of the Year Award for Central Scotland at The Scottish Hair & Beauty Awards. They were also recently awarded a five-star rating in the Phorest Salon Software Client Experience Awards which are based on customer feedback. The team specialise in make-up providing a range of looks, from classic to dramatic, for bridal parties. They also offer a calming presence on the wedding day and often deal with mishaps and problems which arise. “We’ve seen it all on the Big Day – brides passing out, ripped dresses, nervous guests and even transport break-downs. “We help out where we can and always aim to go the extra mile to ensure every bride has a special day. The salon has just launched the Delilah range of cosmetics which are a favourite with celebrities including TV presenter Holly Willoughby. “We’re looking to build on our success and have just started a new relationship with Delilah which we know all our make-up clients, not just our brides, will love. The Official Make Up Awards, organised by Creative Oceanic, were launched to celebrate the achievements of Britain’s make-up industry. Salons and individuals were nominated by members of the public with 45 front-runners from across Britain picked as finalists for the Bridal Make Up category. Each finalist had to submit evidence of their success and achievements before the winners were announced at a glitzy ceremony hosted by DJ Steve Sale at the Mercure Manchester Piccadilly Hotel. “It was an inspiring night dedicated to those who spend their career making people look beautiful. Published by Blackburn Communications on June 11, 2018. Featured in The Stirling News.